I bring to the table twenty years of experience in international media, creative and entertainment industries in administrative, managerial and entrepreneurial roles. Undertaking general freelance roles utilising my skill bases above. Entertainment Assistant (Gaming) – Announcer for Gaming Floor promotions. Interacting with Casino patrons for the provision of prizes and providing information on promotions and general assistance on the gaming floor. Administration (Health & Safety & Workers Compensation) - Management of Return to Work plans for injured Casino staff. Accounts management and ad hoc administrative tasks for department. 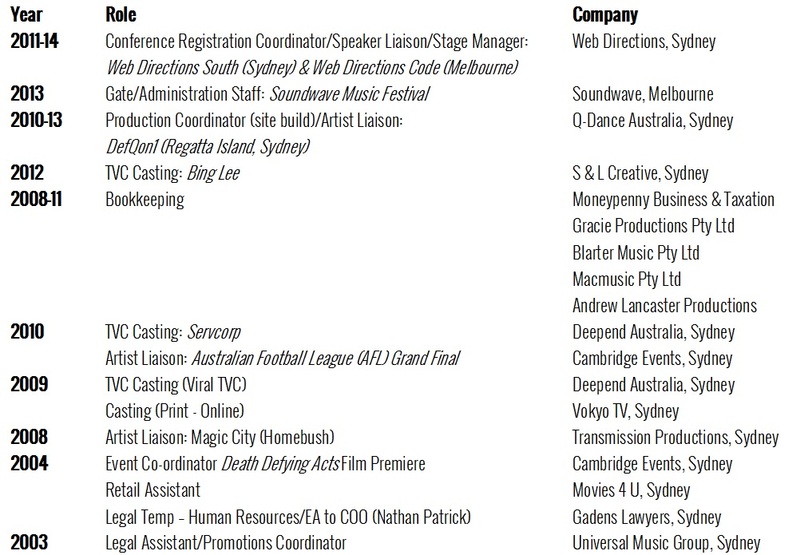 As agent - liaison with casting directors and production companies to secure and manage talent engagements. The Family/Australia’s Next Top Model/WAG Nation/The Biggest Loser/The Voice/Class of 2011/The Renovators) and drawing up contractual elements for same. As a freelance writer, I interviewed artists for editorial features as well as wrote critical reviews on film and music releases. I researched and interviewed the major acts for the 2004 tour. In the lead up to the 2006 tour, I wrote a weekly newsletter in character (Melodie Mars) for online and 3G mobile streaming (Vodafone). As a freelance writer, I wrote entertainment content (Big Day Out, Australian Idol 2006 series) for mobile 3G distribution (Telstra/Vodafone). Drafting and negotiation of license agreements for program footage and archive materials for local/international television networks, media companies and the public. Managed legal documentation requests and provided advice to our production offices and clients locally and internationally. Managed music publishing and royalty/residual payments. Consulted with Commissioning Editors in regard to key elements for funding decisions and approvals. Drafted and negotiated letters of offer and presales agreements with producers and funding bodies. Coordinated the Opening Night Screening and Party for 1,800 people and Closing Night function for 600 people. Organised sponsor screenings and assisted at premiere screenings and functions for industry personnel. Researched animation talent in the UK/internationally as well as writers, talent, production personnel, locations, studio facilities. Researched, compiled and initiated creative discussions with talent approached in respect to the development of the film (incl. Terry Gilliam, Quentin Tarantino, Joss Whedon, Guy Ritchie). Point of contact for the band’s management, EMI Music, Passion Pictures and general public. Prepared project applications for Film Council Board review. Prepared short form agreements (Offer Letters, Development Agreements, Cast Deal Memos). Liaised with UK producers, legal counsel, UK funding bodies, film organisations (local and international) regarding Business Affairs documentation requirements in film funding deals and franchisee’s (Pathé Pictures, The Film Consortium & DNA Films) with regard to development of new projects. Coordinated the annual edit of the Council’s Funding and Production Guidelines in liaison with Film Council personnel, the UK film community and legal representatives. The Arts Council is the primary performing arts funding body in the United Kingdom. I attended arts events and wrote critical reviews to assist funding decisions made by the Council. Liaised with the Internet/New Media/Editorial producers in the Group internationally (excluding the US) regarding delivery formats, new media, software and legal/policy guidelines for maintaining “Best Practice” for the production of digital media, interactive and software mediums within the Group. Involved in the development and sourcing of new programming material and talent as well as attending key events and performances to keep abreast of emerging talent. Booked and coordinated cast and crew for shoots and functioned as director’s assistant and production runner during shooting. Sourced wardrobe, props and shooting locations including negotiating fees and contracting for same. Prepared all cast, crew and creative agreements in liaison with Legal & Business Affairs Manager. Organised all creative sessions and program launch events.